One of the big problems of water treatment is how to deal with iron in water used for irrigation. When well water with iron is used for watering landscaping, it leaves stains on buildings, sidewalks, and driveways. Although homeowners often try to cure the problem with conventional iron filters, this approach is seldom satisfactory. The problem is that iron filters have a limited capacity between regeneration sessions. If used for water inside the home, an iron filter only has to process a few hundred gallons of water per day at a moderate flow rate. The filter has time to backwash and renew itself at night. With irrigation applications, however, the filter might be required to process thousands of gallons per day at a high flow rate. Iron filters used for significant irrigation jobs work only when they are sized very large, and usually multiple filters are required so that one can be regenerated while others are in service. To keep iron from staining buildings and walks, an alternative to filtering is sequestration of the iron. In this process, iron is not removed from the water but simply chemically bound so that it does not cause staining. Treatment is done by injecting the concentrated chemical into the water line, either with an electric chemical pump or with a passive siphoning system powered by the flow of water itself. Both systems work well. 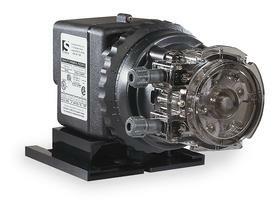 This Stenner Peristaltic Pump can be used to feed a sequestering solution (poly-phosphate) into the stream of irrigation water. Once the system is in place, upkeep involves only occasionally adding the sequestering agent to the solution tank. Sequestration can be accomplished using either standard electric feed pumps of the type used to feed chlorine or specially designed feeders that use the force of the irrigation water itself flowing through the pipe to power the injection process. The non-electric systems are more accurate if flow rates vary and they are easier to set up because they adjust automatically to changing flow rates. 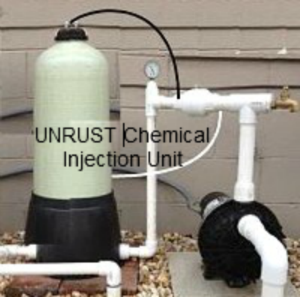 The “Unrust” brand chemical injection system shown above is made specifically for wells used for landscape irrigation. Needing no electricity, the Unrust system feeds a stain-prevention solution into the irrigation water as it flows through the pipe toward sprinklers.